If you’ve read Simple Church, by Thom S. Rainer and Eric Geiger, then you probably know where this student ministry counterpart is going. 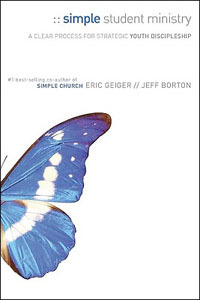 However, unlike Simple Church that was about 10 times longer than it needed to be (especially for a book about being simple), Simple Student Ministry, by Eric Geiger and Jeff Borton, does not feel drawn out to fill pages. In fact, Simple Student Ministry is a pretty quick book that every youth pastor should read. Too many youth ministries are busy and crammed full with programs and calendars, as if having a lot of people involved in a lot of stuff somehow equals spiritual growth. We strive for the wrong goals, measure our ministries by the wrong standards and strive to give kids an overload of spiritual “opportunities.” Maybe these values are not explicitly stated as such, but they often lead and guide our ministries whether we realize it or not. The result is a youth ministry with a lot of independent programs all somewhat functioning in their own separate silos. How much more effective could our youth ministries be if every program helped teens move through a process of discipleship that was clearly defined and easy to understand? Jeff and Eric also give a lot of practical examples of what this simplified student ministry looks like in many different church and para-church contexts around the country. Basically, the results are same: a simple student ministry increases life-change exponentially, not because there’s anything magical about the strategy, but because you’ll finally have a clear and focused ministry that’s aligned with itself and with the church that is moving people toward Christlikeness in a clear and focused manner. However, my thoughts about the book are not without criticisms or questions. For example, most of the churches that are featured in the book see evangelism as part of the discipleship process, which I wholeheartedly agree, but their approach seems to be largely a “bring your unsaved friends to our church turf so a speaker can share the gospel with them.” (I’ve expressed reasons why I’ve abandoned this form of outreach in an earlier post.) Also, the assumption seems to be that spiritual growth is a straight-forward linear process. I struggle a bit with the idea that moving teenagers through a process of programs can make them a more devoted follower of Christ. We all know that the graph of spiritual growth over time is never a straight upward arrow. It’s ups, downs, setbacks, stumbles, growth spurts, and failures over and over and over again. So how do teens move through a linear strategy for discipleship when the growth process itself is not necessarily linear? These questions and more I’ll be asking Jeff Borton himself this Friday during our LIVE YM Talk when we talk more about Simple Student Ministry. If you’re free this Friday (June 5, 2009) at 2:00 PM eastern time, Jeff and I would love to have you join us. Bring your own questions and thoughts and share them with us during our open conversation. The conference phone call is open to anyone who wants to call in and join the conversation, or whoever wants to just listen in online and participate via the live chat room. Find the phone number and the chat room link on the LIVE YM Talk page.